If you have dogs, you know how much they can cause wear and tear on your car. You probably think about it every time a friend asks for a ride or you have a new guest in the car. Dogs can not only leave a mess behind in your car, but also can leave a smell. Luckily there are a few steps you can take to reduce the impact your pup has on your car. As long as you are proactive with your cleaning, your furry friend shouldn’t have too much impact on your car. Check out our tips to keeping your car clean! Choosing one spot that is your dog’s “seat” will reduce the mess they make in the car. It keeps any dirt or fur contained to one spot. You can also choose to use a crate or restraint for your dog. Using a crate keeps your dog’s messiness even more confined and also keeps them safe! Another item that you can use to reduce the hair in your car is a seat cover. There are a variety of options, such that clip to the seats and others that act as somewhat of a hammock for your pup. You can easily throw these in the wash and it protects the nice material or leather of your seats. However, sometimes you can’t have people also sitting in the back with these. You can also lay down a blanket in the section where your pup sits if that works better for you. While you can’t go back and change your car now, it is good to think proactively. If you’re in the market for a car, think about your dog. There are different features you can get to make cleaning easier. Leather and vinyl materials can be easier to clean, or you can get a stain resistant fabric. There are also cars that have heavy-duty floor mats that protect from any dirt your pup brings in. You can also look for dog friendly cars in general that have spacious back seats and barriers. After your dog is in your car or every few times, clean up right away to avoid the mess getting out of control. You can vacuum or try hacks, like a wet rubber glove. If you dampen a rubber glove and rub the fabric in your car, the hair will come right up. 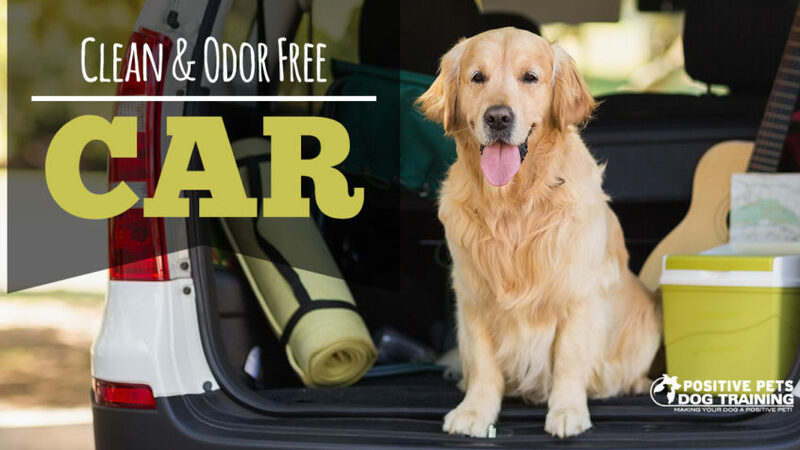 You’ll also want to make sure you use a product to get rid of the smells and odor of your dog. Every few weeks, wash any seat covers or blankets. Another tip is to sprinkle baking soda on the floor and fabric seats and let it sit overnight. In the morning, vacuum it away and it should smell much cleaner. You should always keep supplies like cleaning wipes, paper towels, carpet cleaner, stain remover, etc. in your car. Form a little box and keep in it your trunk for emergencies. If you follow these steps, you should be able to keep your car looking as good as new!